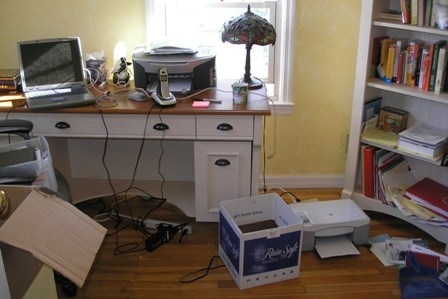 Many households have either a home office or an office area where a computer and important documents are stored. It’s easy for this area to get out of control as more and more documents pile up. The large number of documents coupled with the numerous cords running to and from the computer can make the space feel cluttered and dirty. Here are 3 tips to keep the space clean and organized. The first step to organizing your office space is to eliminate unnecessary documents. Many printers have scanners built in, so you may already have a scanner without knowing. If you do not have a scanner, you should probably invest in a 3 in one printer, scanner and copier. Once you’ve secured a scanner you should begin organizing the documents. Legal documents such as birth certificates should be filed away in a portfolio; everything else can be scanned and thrown away. Another great strategy for getting rid of office space clutter is to get rid of unnecessary cords. Wireless keyboard and mouse sets can be purchased from any electronic store for less than 30 dollars. These go a long way to cut some of the clutter since often the only two cables that aren’t easily hidden are the keyboard and mouse. Another way to cut the cord is to consider buying an all in one computer or laptop to replace your tower. This is a much more expensive option, but if you haven’t updated your computer in a few years it is definitely worth looking into. Many of us like to decorate our computer desks with small knickknacks. While these knickknacks look good when they are first set up, overtime they are thrown askew and often only end up contributing to the clutter. Sometimes these knick-knacks also serve as a distraction during homework and often end up being more trouble than they’re worth. Guest Post by Maria Rainier. She is a freelance writer and blog junkie. She is currently a resident blogger at First in Education where she’s written on teaching jobs along with online esthetician programs. In her spare time, she enjoys yoga, playing piano, and working with origami. If you are a parent, then you realize that every time your child picks up a package of crayons and a piece of paper, they are creating a priceless masterpiece. What could look like a page of scribbles to anyone else is a work of art to you. After years of collecting these treasured mementos, the question many parents find themselves asking is this: Where do we put them? This article will give you five tips on how to safely store and sort through your children’s works of art so that you can enjoy the most special forever. If you try to keep every scrap of paper that your child ever took a marker to, you will soon be over-run. You should sort through the piles of art work regularly, choosing the best to keep, and discarding creations that are less-personal. 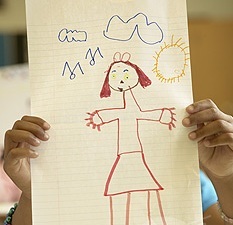 All art-work should be carefully labeled with your child’s name, age, and the date that it was created. If asked, children are often happy to sign and date their work—saving you the time and hassle. Plastic storage totes are great for storing this home-made art and can easily be concealed in a closet or under a bed. 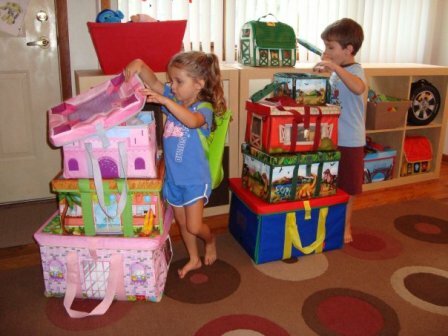 If you have more than one child, consider buying smaller, individual storage totes so that you can keep their handiwork separate. If your child comes home with a pile of color pages, don’t feel that they all have to go on the fridge. 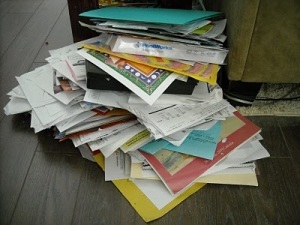 Instead, sort through and find the best, while disposing of those that seem sloppy or half-done. Rather than let your child know that you are throwing away their work, comment on the exceptionally good pictures and sneak the others into the trash when they aren’t looking. Are you completely over-run by drawings? If so, sort through and pick out some of your least favorites. 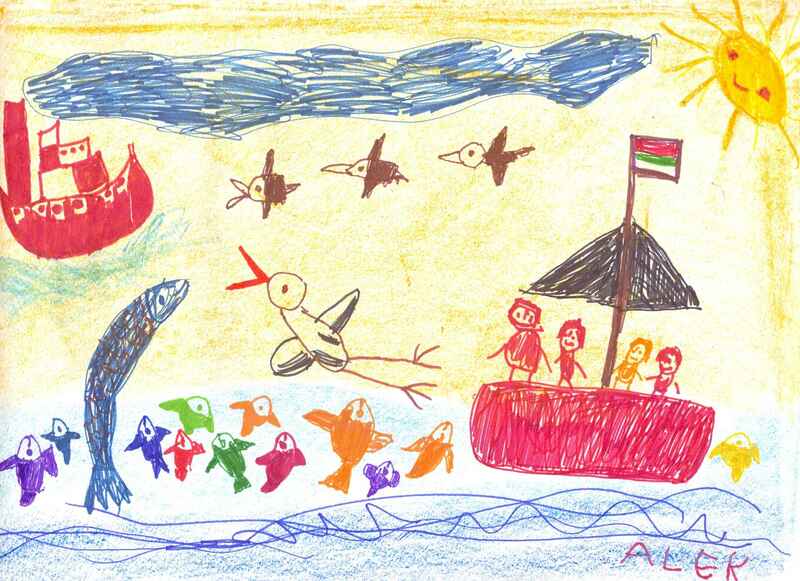 With a little work, children can be easily convinced that recycling the rejected drawings would be the best idea. Rather than say that the drawing wasn’t good, tell your children that it was so special that you would like to use it to wrap a present. By using unwanted artwork in this way, you will be able to rid your house of added clutter while providing yourself with cute, colorful wrapping paper that is completely free. In a house of children, it’s easy for papers to become torn, lost, or destroyed. To save yourself from the disaster of a prized picture being annihilated, take a picture of your child holding their work of art. No matter what happens to the original, children can keep the photo and enjoy showing it off to family and friends. Having photos of artwork can often help parents decide which of the originals they should actually keep and which ones can head out to the recycling bin. Keep copies of all photos on a disk that you can easily insert into the computer when your children want to see their creations; consider calling it something like your “digital gallery”. Children love to see that their careful work is appreciated, so take the time to pick out the best of their designs and display them on the fridge or another special area of the house. Consider which art is actually worthy of being displayed based on the time and effort spent on it. 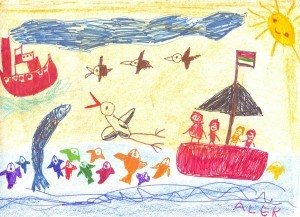 Showing off artwork proves to children that you appreciate what they have done and that you are proud of their talents. By taking the time to actually consider what artwork is worthy of being kept, appeasing children with your “digital gallery”, and recycling, storing artwork just became a much easier task! Tom Walker analyses ink cartridges all day every day and has become an internet researcher of Dell ink, among other things. Even if you are generally a neat person, clutter can tend to build up around the best of us almost automatically and certainly uncannily. 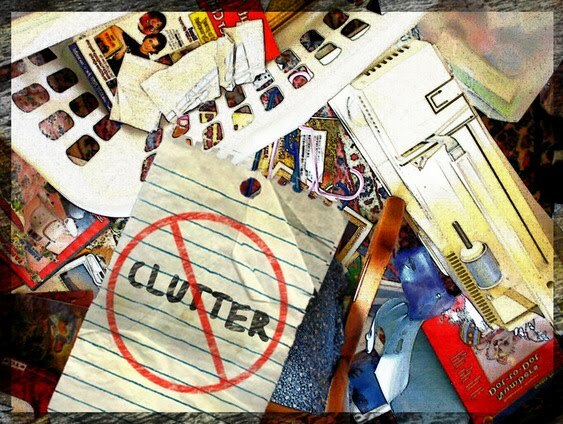 Besides its obvious organizational problems, clutter is rumored to also have a number of psychological effects on us. It is said that clutter makes it harder to focus or work on things that matter to us. Even in only slightly cluttered environments, the bare minimum of mess can lead to a more confusing, distracting life than necessary. Here are a few other ways clutter can reduce your productivity whether in the office or at home. 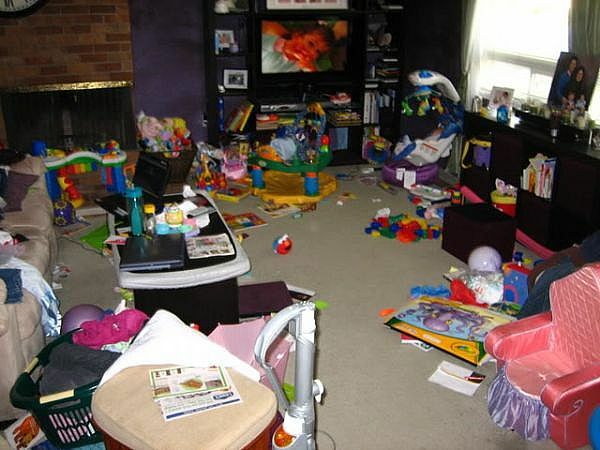 An increase in the clutter usually means an increase in losing important things in it. Besides keys and wallets, important papers and receipts are some of the first things to go. When you have to spend time sifting through the clutter to find the things you need, productive minutes and hours are lost. The more space you reserve for clutter, the less space you can use to work in. In the best case scenario you will feel slightly more cramped, and in the worst case scenario you won’t be able to find a free square foot to rest your elbows. Both work and clutter take space. It’s up to you to decide which is more deserving. Many people admit that a cluttered house or office does nothing to take away from the stress level in their life and, in fact, may add to it. Some people say that stress stems from clutter, and others insist that clutter comes from stress. Either way, they are closely related, and cutting down on one may just help to cut down on the other. Clutter is well known to be a source of serious procrastination, and this can take place in a number of ways. For some, clutter can divide their attention between pressing work and pressing housework. For others, clutter puts more interesting things into their line of vision than the work at hand. However it happens, clutter simply does not motivate you to work hard. Besides all the technical and scientific aspects of clutter and its physical effects on your work habits, clutter can be a real mood killer. Having to step over piles of junk, static, flotsam, and jetsam just to maneuver around your own personal space can provoke frustration and drain enthusiasm, bringing on bouts of depression and low energy. Better just to get rid of it. Here are five ways to help you cut down on the clutter in your environment and keep your life tidier and more organized. Divide your clutter up into main categories and designate a certain specific location for each category. Papers can be filed out of sight. Jewelry can be put into the jewelry drawer. Have a shelf to keep all your books in an easily remembered order, and a good, deep bin for the trash. Don’t be afraid to throw things out that you no longer need. If the clutter in your house is overwhelming and just the thought of taking care of it all makes you light-headed, consider devoting just five or ten minutes to whittling it down a bit today. Then, do the same tomorrow. Repeat as needed until, as if by magic, your house slowly but surely turns into a haven of peace and organization once again. Although storage is considered in many circles to be just another form of clutter, if you can’t bring yourself to throw something out, having it out of sight and in a box is much better than keeping it on your desk beside a pile of gum wrappers. Use the attic and the garage to store your clutter – that’s what they’re for – and keep your personal spaces tidy. If you are no organizational expert, get someone who is to come in and give you a few suggestions. Your more organized friends will probably consider it an honor to be invited over in a professional advisory capacity and many will probably even enjoy helping you through the process. Getting rid of clutter is a lifetime process. The only way to keep it down for good is to keep at it. James works at Spares Next Day, one of the top suppliers of vacuum bags in the UK.